Get detailed information from the customer about the symptom (the condition and the environment when the incident/malfunction occurred). Try to confirm the symptom described by the customer. Verify relation between the symptom and the condition when the symptom is detected. Refer to AV-285, "Symptom Table". Reconnect parts or connectors disconnected during Diagnostic Procedure. 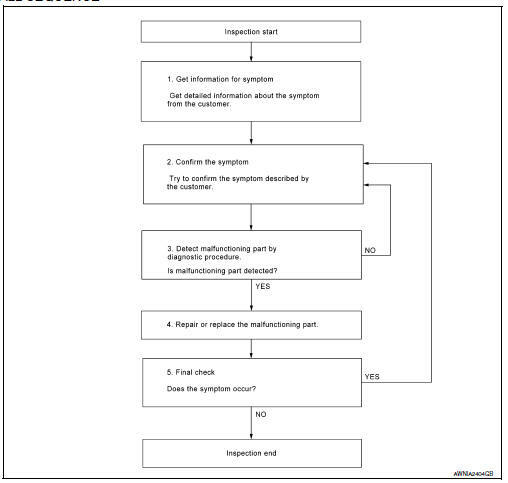 Refer to confirmed symptom in step 2, and make sure that the symptom is not detected. Was the repair confirmed? YES >> Inspection End. When replacing AV control unit, save or print current vehicle specification with CONSULT configuration before replacement. If вЂњBefore Replace ECUвЂќ cannot be used, use the вЂњAfter Replace ECUвЂќ or вЂњManual ConfigurationвЂќ after replacing AV control unit. When replacing AV control unit, you must perform вЂњAfter Replace ECUвЂќ with CONSULT. Enter вЂњRe/Programming, ConfigurationвЂќ and perform вЂњBefore Replace ECUвЂќ to save or print current vehicle specification. Replace AV control unit. Refer to AV-298, "Removal and Installation". If вЂњBefore Replace ECUвЂќ operation was performed, automatically an "Operation Log Selection" screen will be displayed. Select the applicable file from the "Saved Data List" and press вЂњConfirmвЂќ to write vehicle specification. Refer to AV-251, "CONFIGURATION (AV CONTROL UNIT) : Work Procedure". If вЂњBefore Replace ECUвЂќ operation was not performed, select "After Replace ECU" or "Manual Configuration" to write vehicle specification. Refer to AV-251, "CONFIGURATION (AV CONTROL UNIT) : Work Procedure". Check that the operation of the AV control unit and camera images (fixed guide lines) are normal. Vehicle specification needs to be written with CONSULT because it is not written after replacing AV control unit. When replacing AV control unit, you must perform вЂњSelect Saved Data ListвЂќ or "After Replace ECU" with CONSULT. Complete the procedure of вЂњSelect Saved Data ListвЂќ or "After Replace ECU" in order. If you set incorrect вЂњSelect Saved Data ListвЂќ or "After Replace ECU", incidents might occur. Never perform вЂњSelect Saved Data ListвЂќ or "After Replace ECU" except for new AV control unit. Select вЂњReprogramming, ConfigurationвЂќ of AV control unit. Automatically вЂњOperation Log SelectionвЂќ window will display if вЂњBefore Replace ECUвЂќ was performed. Select applicable file from the вЂњSave Data ListвЂќ and press вЂњConfirmвЂќ. Select вЂњAfter Replace ECUвЂќ or вЂњManual ConfigurationвЂќ. Identify the correct model and configuration list. Refer to AV-252, "CONFIGURATION (AV CONTROL UNIT) : Configuration List". Confirm and/or change setting value for each item. Thoroughly read and understand the vehicle specification. ECU control may not operate normally if the setting is not correct. Make sure to select вЂњNextвЂќ, confirm each setting value and press вЂњOKвЂќ even if the indicated configuration of brand new AV control unit is same as the desirable configuration. If not, configuration which is set automatically by selecting vehicle model can not be memorized. Confirm that each function controlled by AV control unit operates normally.